Tim Rhodes has been involved in running since 1977 and finds himself fortunate to be able to live out his passion each and every day through his work. He has run 12 marathons and has been to countless others to help with timing services. So he certainly knows what a good marathon experience feels like. Tim the the organizer of the Charlotte’s Thunder Road Marathon. Hello, on December 2nd 2009, you’ll be organizing the Charlotte’s Thunder Road Marathon. Can you tell us where it is located? 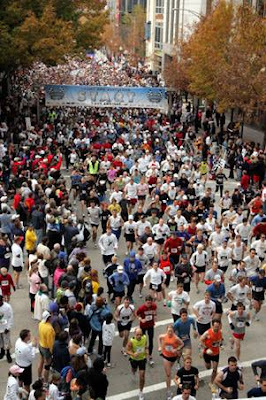 Charlotte’s Thunder Road Marathon starts and finishes in Uptown Charlotte, NC. 2009 will be the fifth year. We started it because the old marathon went out of business and as a local running specialty store owner and race director, I was intrigued by the challenge of starting a new event. The name pays tribute to Charlotte’s stock car racing heritage, but also symbolizes pounding feet and the beat of music. Charlotte can be a challenging place to run. We have some hills, but nothing too “killer”. The first half is a loop that brings you back to within about three blocks of the finish, then does another 3.2 mile loop that again brings you back to Uptown, followed by another 2 mile loop that does the same again. None of it is out and back, but the loops make it a spectator friendly event if you are looking to track a specific runner. Last year we had over 7000 including the half marathon and 5K. Our projections call for 8,400 this year. We expect runners of all types and from all locations. Last year runners represented 46 different states, DC, Mexico and Canada. Yes, several. Anything from 5Ks to 15Ks and Half Marathons. It is really ideal. We have been perfect three of four years. The second year it was a bit cold, but nothing too bad – it eventually warmed up. The typical low for that time of year is upper 30s with a high in the low to mid 50s. Music, food, sporting events, expo, museum tours, Speedway tours, you name it. We hope you come to Charlotte prepared to go out and experience what we are about. No sitting in your hotel room waiting for the race or after the race waiting for your flight home. If you are coming to Charlotte you might as well enjoy it. The marathon finished, what advice would you give a runner who has never been to Charlotte before? A good restaurant, a fancy sightseeing? Go out to the speedway and take in a Richard Petty Driving Experience. You can either drive a stock car 8 laps or ride in one for 3 laps – both at 160 miles per hour. You’ll never run THAT fast! We don’t do a pasta dinner – boring! Get out and enjoy the local restaurants. They are fantastic. Charlotte is home to Johnson&Wales University so culinary is on our blood. In a single sentence, what would you tell the readers of Ahotu Marathons to make them register for the Charlotte’s Thunder Road Marathon? BIG marathon experience without all the hassle- world class event. If not I will give you your money back. Seriously.